If you have an infant or a toddler who loves dancing to the beat of their own drum, this is the perfect toy for them! Almost every piece of music has some sort of drum used to keep the beat. Anthropologists even say that the drum could pretty well be the very first musical instrument that men used to create rhythm and move people into action. Crazy, right? We’re here to help make your tedious search a little less stressful, and a little more fun. This is why we came up with the best ten drums for you in today’s market. We looked at everything from affordability, quality, highest rating and overall customer satisfaction. Take a look below and we’re sure you will find the best drum your little one can drum along and dance the beat too. We have reviewed each drum on this page and created a list with the 10 top drums for kids and toddlers from the current marketplace. Each product has an updated status and the criteria sections have also been updated. Maybe a complete play drum set is overwhelming for your child. If so, this single drum toy is an excellent choice if you have simplicity in mind. It’s made to engage your child’s senses with an illuminating light display that activates with every drum tap. 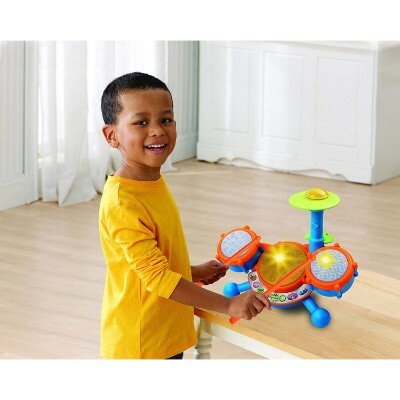 The toy drum comes complete with colors, lights, numbers, and sounds with an easy-to-grab handle and its small enough to be played anywhere. Three learning and play modes are included for an interactive and fulfilling experience. We adore the Tap-To-Play feature because it’s so simple and intuitive for small children that we just had to include this drum set on the list. All your child has to do is tap the drum to begin the fun! This feature creates a seamless experience for your child, instantly engaging them in imaginative and sensory based play time. Because their using their sense of touch, hearing, and sight to engage with this toy, your child is getting a truly rounded and forming experience. The Baby Light and Giggle has a very simple interface yet the light effects and music played can nevertheless, be instrumental in optimum brain development. When the band needs a drummer on the go this is the drum set for them. It is a portable drum set for taking any great band on the road. Inside the drum, it also comes with seven other instruments. They can all be transported and stored in the drum. This makes for easy cleanup and simple to take to the grandparents’ house for the weekend. 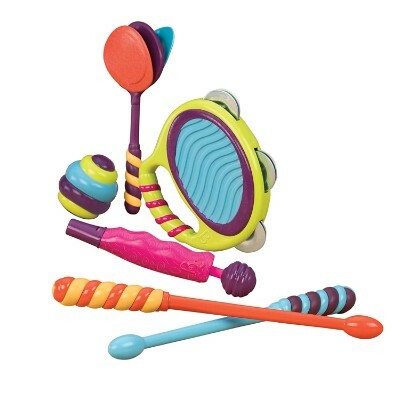 The set features a drum, whistle, shaking egg, tambourine, drumsticks, and much more. It is best suited for children over the age of 18 months. A love for music is one of the best gifts that you can give a child. The rhythm and beats create neuron connections that support healthy brain development. It is not only a great way to support their cognitive development but also builds their creative development. 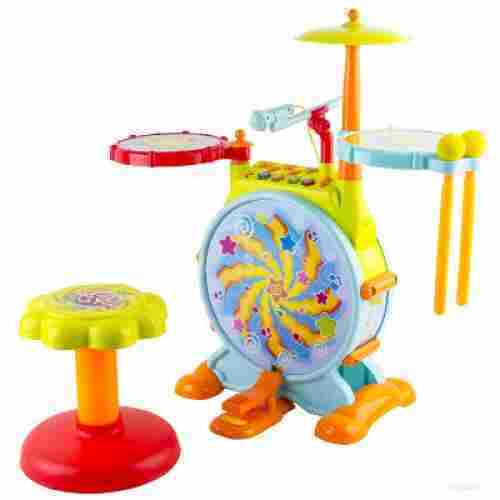 Cute drum set for younger kids. The other instruments included are a complete bonus to the set. 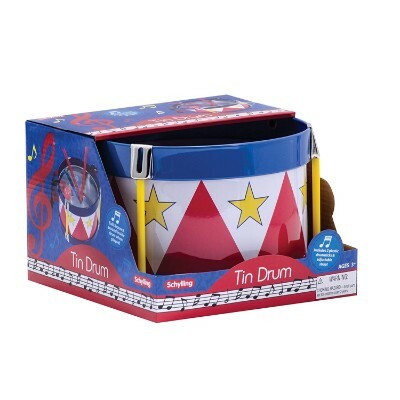 This learning toy drum set is an excellent way for your child to develop their musical abilities. Two drumsticks, three drum pads, and one cymbal are included. Your child can play along with nine built-in melodies or the learning mode for a more disciplined play. There are four modes of play with a diverse collection of sounds your child will love. VTech is an amazing company that creates toys geared towards the overall development of children. 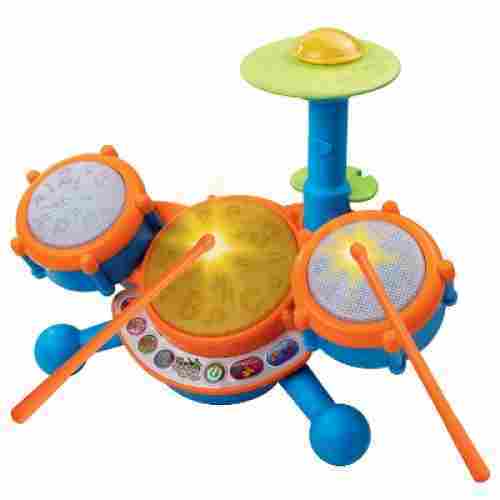 That’s why the VTech KiddiBeats drum set is at the very top of our list! We find this drum set so beneficial for its auditory and visual components. Not only can your child learn new melodies and follow along to the pre-recorded ones, but the built in LED lights stimulate their visual sense for a truly engaging experience. You’ll never go wrong with the KidiBeats. The integration of 2 learning modes to 2 other musical modes is enough to help ensure your kid’s optimum development. 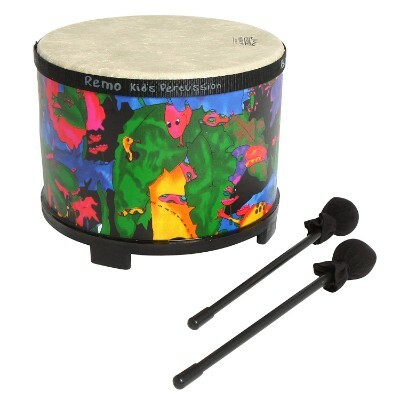 This drum focuses on your child’s creativity and individuality which is great for the artistic and unique child! The drum comes with seven, easy-to-handle instruments that have unique musical functions, ability, and sounds and can be played with family and friends. 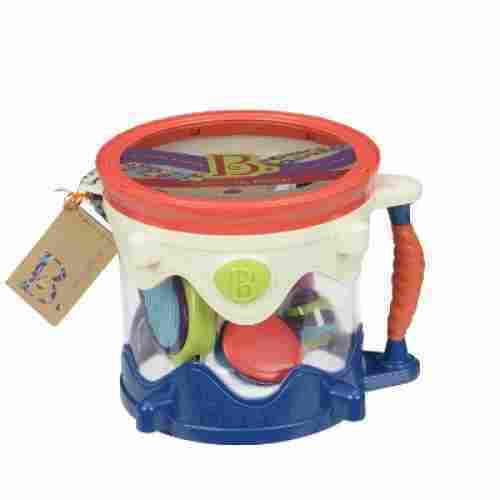 The toy drum also has a large handle that makes it easy for your child to grab and hold the toy drum and a strap is included for easy-over-shoulder carry. 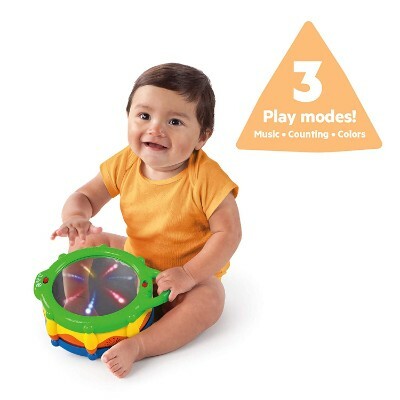 This toy drum doesn’t come with a learning mode as this drum toy is all about free expression. 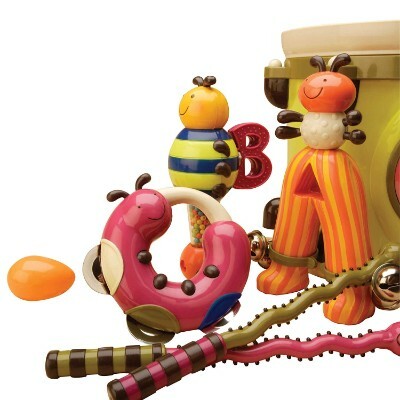 What we love and find super beneficial about this set are the colorful and creative bug characters. The design of the instruments makes them perfect for a child’s growing imagination, and keeps them engaged with their fun designs and colors. The inclusion of fun design elements into the ParumPumPum makes it a very unique tool for aiding kids with their imagination and music creative potential. Your child will learn fantastic rhythm with this floor drum! 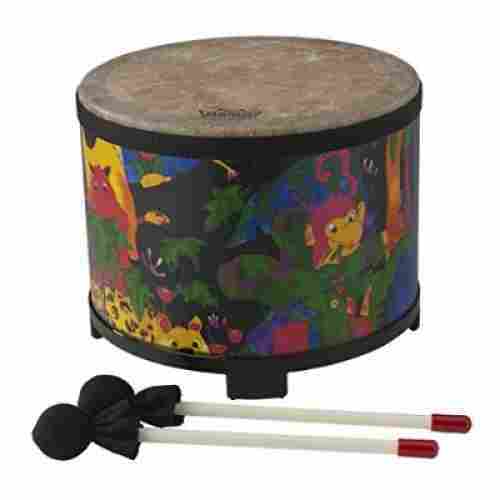 It has a colorful and fun rainforest animals design, a compact size, and mallets to create banging sounds. The floor drum is constructed from acoustician material for superb projection and enhanced fundamentals. The drum head uses fiberskyn 3 to produce full-bodied, warm tones. If you’re serious about your child learning rhythm, percussion and music in general, this is the best drum for your child to learn from. This floor drum is strictly focused on creating rhythm and when a child learns proper rhythm they learn coordination, pattern recognition and develop finely tuned listening skills. The focus of this drum is to teach your child how to create music with a percussion instrument correctly. For something more relaxed and comfortable, this toy drum is a natural choice for you to make. The drum is small, compact and colorful in red, white and blue. It comes with two red drumsticks constructed from wood and an adjustable, removable strap so your child can carry the beat with them wherever they go. 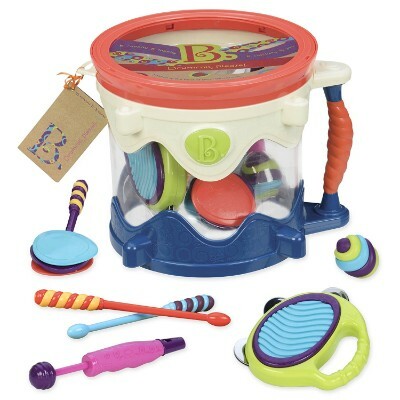 What makes this toy drum extra fun are the included colored bounce balls inside the toy drum that bounce around and make their own unique sounds when your child taps on the drum. Your child will lead the parade with a powerful beat! The sound level of this tin drum is lower compared to other toy drums which can help children who are easily disturbed by loud noises. The child-like quality of the toy drum makes it easy for your child to play without unnecessary interactive features that could hinder a child’s free play. Looking at the Wolvol Electric Big Toy Drum Set for Kids, it has striking resemblance to the Best Choice Products drums for toddlers. It comes with the same fully adjustable volume so you can easily adjust the loudness or softness of the music play. It has two snare drums conveniently located on both sides of the bass drum. A rod connects the cymbal to the bass drum as well. 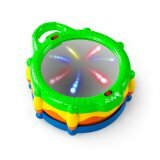 The top of the bass drum comes with light-up buttons that provide remarkable sound effects to the percussion instrument. It also includes songs, dance music, and melodies which toddlers can beat to. The accompanying stool and sing along microphone are remarkably similar as well. So what’s the difference? 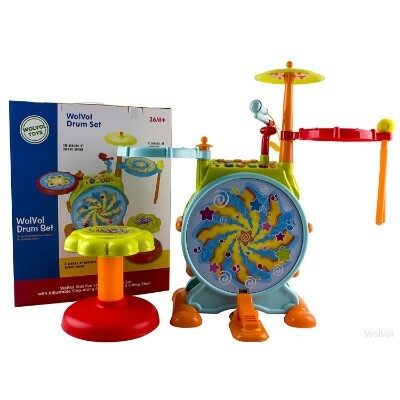 Well, as it turns out, the WolVol product is slightly less expensive than the BCP drums for toddlers. Additionally, while the BCP enjoys a 4.8 star average in its customer satisfaction, this only accounted for 30 reviews. On the other hand, the WolVol managed to garner 4.3 stars out of 81 reviewers. Technically, you can choose either of the two. But if you want to save a few bucks, then get the WolVol; otherwise, the BCP should remain a very viable option. What kid doesn’t want to be a rock star? WolVol makes your child’s dream a reality with their super-sized drum set and mic setup. Watch your child sing and play their hearts out on this amazing set of educational drums and mic. The WolVol offers a good way to get young kids introduced to drumming but in a manner that is fun and fulfilling. 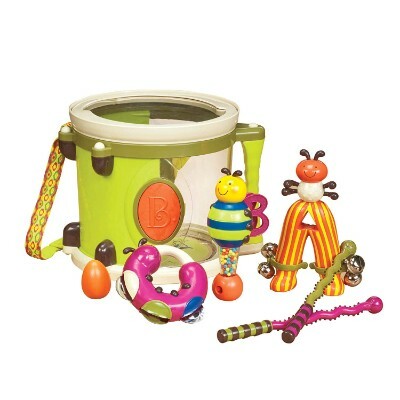 The bangin’ and boppin’ is non-stop fun for this toy drum! The drum is constructed from rubberwood and includes a mallet with a rubber tip. The drum head has a unique zigzag cutout pattern that helps to increase music quality and generate enjoyable sounds. 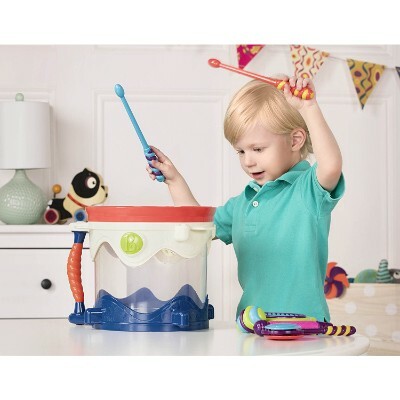 It has a red and blue geometric design, and the toy drum is crafted to be kid friendly for beginning drummers in the preschool age range. 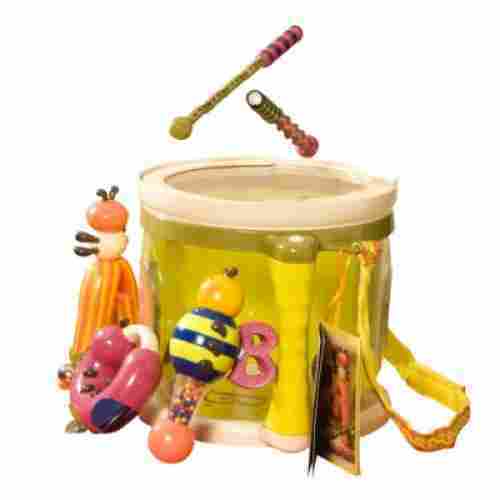 This toy drum helps to develop a variety of abilities that include auditory skills, hand-eye coordination, fine and gross motor skills, sensory skills and rhythm, melody sensibilities. The drumhead is crafted to produce different sounds with the built-in zigzag design. When you strike the zigzag cutout in different spots, you receive a diverse collection of musical notes. 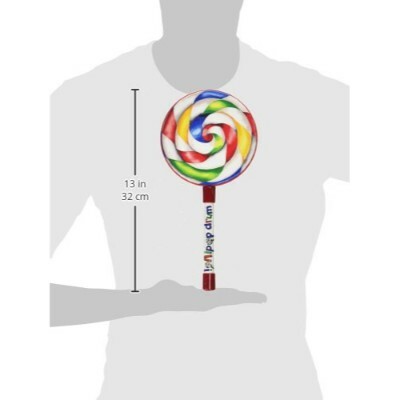 Keep flavor in the music with this candy shaped drum! In the design of a lollipop, the toy drum comes in three sizes that are easy to grab, hold, and play. Its construction is acoustic-on-shell with a plastic handle that makes it easy for small hands to use and control. A colorful mallet is included to help your child to develop a drum beat, but their hands can be used as well if desired. 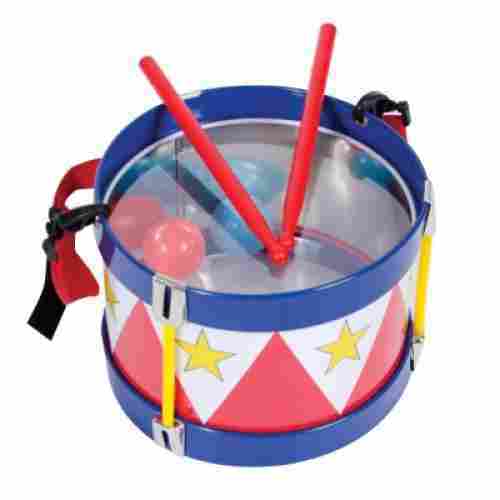 This toy drum is great for the classroom, recess, recreational activities and traveling. 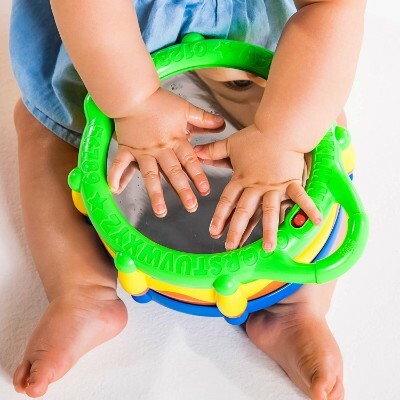 The toy drum is held while in use, this will help your child to develop their fine motor skills in grasping, holding and develop their gross motor skills in using their arms while banging away on the drum. The distinctive design of the lollipop keeps the toy drum always fun and exciting and will surely hold the attention of your child. Creating fun, vibrant, and rich drum sounds with this set of drums is fun for toddlers. 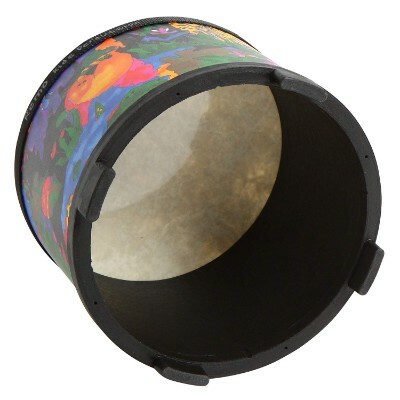 Each of the drumheads come pre-tuned and features an Acousticon shell with a rainforest themed finish. They are great for teaching toddlers about rhythms and beats. 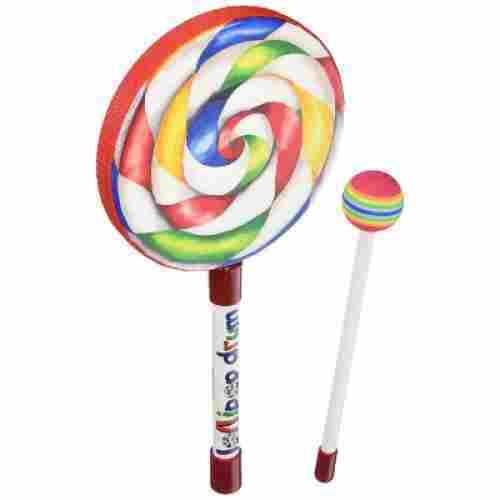 Included with the set is also a rainbow color mallet. The set includes five drums; a six inch, an eight inch, a ten inch, twelve inches, and fourteen-inch drum. Each of the drums is one inch thick. This engaging award-winning drum set will engage the children for hours. Learning to play music has many benefits and the more those benefits are studied they realize that making music has a long-lasting effect on self-discipline. The self-discipline also has an effect on their self-confidence. The more children are introduced to music often the more self-confidence and discipline they have as adults. With a set of drums like this everyone in the whole family can join in. They are a great addition to a classroom or family fun night. Simple design and simple to play. For every list we create, we have certain things for each product that we look for which is known as our criteria of evaluation. 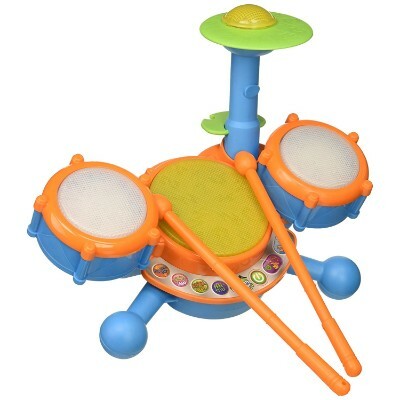 For the best drum sets for your infant and toddler, we included safety, child development, and of course, creativity. With any toy that parents buy, you want to make sure that your child is 100 percent safe while playing with it. Especially with young children, parents want to make sure that they don’t have to worry about small parts their infant could choke on. This is exactly why safety was considered in our picking. When judging the perfect drum set for your child’s safety, we looked at sturdiness and the construction of the drum itself. For your child’s overall development, we screened these drum sets for motor skill, auditory and visual development within your child. Finally, last but not least, we evaluated the creative component of each product. We chose each drum set’s ability to foster creativity and looked at them through the eyes of a child and wondered just how long it would keep them engaged. Ultimately, we determined just how much creative energy goes into playing with this specific toy. For a more in-depth explanation for our criteria sections, please read the following. Choosing a toy that will help your child’s development is always tricky. When looking at these drum sets, we considered that hand-eye coordination and of course the motor-skill development are very important for your children. When your child interacts with a drum, the drum itself produces a sound, and all of these sets will engage your child’s mind in tandem with their body. This is super-important because it helps the overall development of your child’s brain and helps your child’s motor skills, which will help your child later in life. If you’re looking to see earlier development in your child, like auditory and visual development, musical toys are must-have items. Drum sets are particularly easier for your child to grasp because the drum itself is a very simple toy. All your child will need is to have fun and learn to tap and boom! Off they will go. Creativity could go underneath overall development, but we felt that creativity was far too important to be lumped in with something else. A child’s imagination and creativity are integral to their overall success. To be creative means that a child can solve complex problems, create stories, understand advanced concepts, and so much more. Like all musical toys, drum sets have the ability to cultivate your child’s imagination and creativity. When your child plays with a drum set, they practice rhythm, melodies, and complex tunes all from their own brain! It’s amazing what a child can come up with just with their own hands, and a toddler drum kit gives them the ability to take all those beautiful creations of their mind and form them through music. There is a myth that children under 7 years old have a hard time learning to play the drums. This is completely myth. Children as young as 2 years old have learned to play the drums. Learning to play the drums helps develop strong problem solving skills. Safety is one of our biggest concerns with any product list that we create. No matter the product, we want to make sure that your child is 100 percent safe and happy with any of their toys during playtime. With baby drum sets, the risk of something that isn’t safe for your baby is relatively low. All of the drums on this list are completely sturdy and have wonderful structural integrity. This means that the sturdy structure will keep the toys from breaking no matter how many times your child decides to drop or throw it around the room. Overall, the toys we’ve placed on this list have a very little chance of breaking and an even smaller chance of harming your child during playtime. But, like always, be sure to practice appropriate and correct toy care to prevent any lasting damage to your drum set that might occur. There are numerous studies and literature showing the effects of drumming on children’s development. Even children with special needs greatly benefit from playing with such musical instruments. Children can benefit a lot from drumming and it is highly recommended to start exposing them to this wonderful art of rhythm creation as early as possible. Here are the benefits of drumming for babies and toddlers. It promotes optimum brain development. Drums for babies are different from those of older kids. These are integrated with a lot of colors, sound effects, textures, and light shows that are all geared toward enhancing sensory processing which leads to brain development. It lays the foundation for fine-motor development. When babies bang on a drum, they do so with the force originating from the entire length of the arm and not necessarily from the wrist or hand itself. This is crucial as the larger muscle groups must be developed first before any significant improvements in finer muscle groups can be achieved. It provides the framework for hand-eye coordination. Drumming requires the excellent coordination of the different muscle groups which also receive input from visual and auditory cues. It is this integration of sensory information and its resulting motor function which lays the foundation for visual-motor coordination. It helps release pent-up energy in a very constructive way. Babies can get stressed, too. They must also be able to release this negative energy. Drumming helps them do that. q: Will a drum set help improve my child’s creativity? Yes, a drum set will dramatically help your child’s creativity! 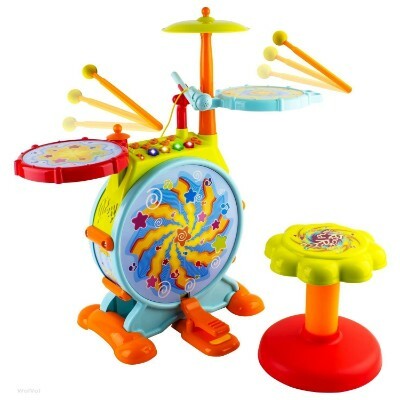 Drum sets, or any kind of music-making toy, stimulates your child’s imagination. Because the child is producing the music themselves, and having quite a bit of fun while doing it, they are engaging their auditory senses. This activity helps develop their more detail-oriented listening skills, while also incentivizes them to create more and different music. q: Can a drum set help my child’s hand-eye coordination? Just how drums for babies promotes creativity in children, drum sets also dramatically improve a child’s hand-eye coordination. Because a drum set requires the child to hit and pound the drum to produce sound, the child soon learns that hitting the drum differently produces different sounds. So not only is your child creating music, but they’re also learning how to produce sounds using their hands and the drum. q: What will a drum set do for my child’s overall creativity? Overall, you will see a boost in your child’s creativity thanks to the addition of a drum set. Like all musical toys, drum sets are fun because your child gets to create their own music. By creating their own music, your child gets to experiment with sounds, rhythm, and melodies. This creates a very imaginative environment for your child filled with their own creations, thus promoting a level of creativity a child wouldn’t get with non-musical toys. q: What other benefits can a drum set bring to my child? Strangely enough, a drum set can actually make your child physically stronger. Because drum sets require your child to reuse the same muscle groups over and over again, they develop really strong arms and shoulders. This might not seem very beneficial, but a lot rests on your child’s shoulders. For one thing, your child’s upper body and neck are supported by the shoulders. By strengthening your child’s arms and shoulders, their posture is also aided. q: What are the biggest safety concerns with drum sets? Drum sets are fairly safe toys, but there is one danger, in particular, you want to watch out for. Because a child will be continuously hitting and banging on the drum set, you want to be sure the drum itself is sturdy. If not, then the child could break the toy. And if the toy breaks, that means your child could injure their hands, possibly choke on the pieces, or become injured in the kick back. But, lucky for you, all the drum sets on this list are extremely sturdy. q: Is there an appropriate or recommended age for drum sets? 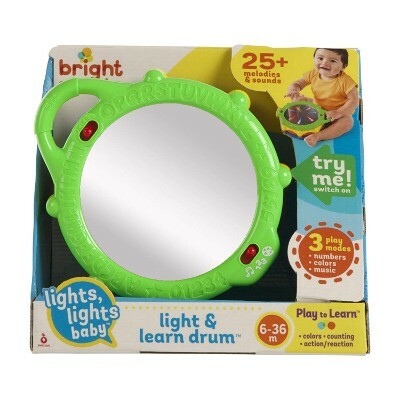 Children as young as 6 months can play with toy drum sets; it all just comes down to what the recommended age of the product is. If a drum set is recommended for 6 to 18 month olds, then an older child right become bored with it very fast. If a child is below the recommended age, then the toy might be so complicated for them that they won’t know what to do with it. So, while there really is no right or wrong age for drum sets, always go by the recommended product age. q: Would a drum set help my child socialize or improve socially? While playing an instrument can do many things for your child, playing music has not been shown to create more social children. Now, if you incorporate other children into musical playtime, say playing pretend band, then it could have some social impact.